The first time I played this game, I hated it. I was in Middle school and an old friend of mine named Chad raved about this game all year. I had my mom take me to blockbuster one Friday, and I rented it. I played the game for about 45 minutes and decided it was garbage. My brother picked it up, started playing, and he REALLY enjoyed it. I think we eventually bought the game because my brother liked it so much. About a year later I decided to give it a whirl, and lo and behold, something snapped. The game was enjoyable! 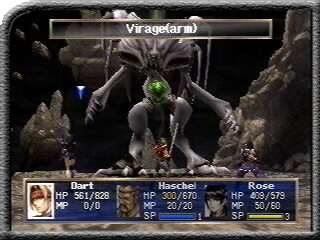 I played this game shortly after I played Final Fantasy 9. I tried to compare this game to FFIX and I was wrong to do so. The combat is much more involved as there are timed hits you must execute to increase your damage. (Similar to Super Mario RPG) There comes a point in the story where the characters are able to transform into some baller dragoons which give them special abilities and wings. Once this feature kicks in, the real fun begins. At the time I think the main thing that turned me off was the graphics. 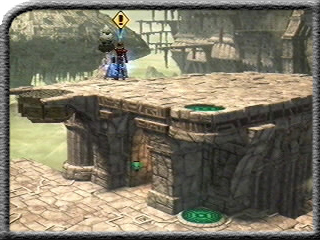 The game had some nice backdrops for the time period, but again comparing this game to FFIX skewed my vision. I think the overall look of the game suits it well, and I couldn’t imagine it being any different. Take out his arms for maximum effectiveness. The story is very engaging, yet kind of cliche as most JRPGs are. The story itself isn’t as much of a chiche as some of the elements within the story. Damsel in distress, missing parents, village being destroyed, crazy god looking to destroy all life on the planet; it’s all there. The musical score is great as well. The battle music gets you pumped up to kill dragons, the boss music keeps the blood flowing, and the town music gives you a sense of peace. This game also has one of the saddest moments in my gaming history. If you played this, you probably cried too. Laws were meant to be abusively changed. The only real issue with the game: ZENEBATOS, ZENEBATOS, ZENEBATOS. This is one of the few games I’ve played where I’ve hated it, then grew to love it. I’ve had games where I thought I would love it, yet felt completely disappointed by (I’m looking at you Skyrim) but that’s the fun of being a gamer. 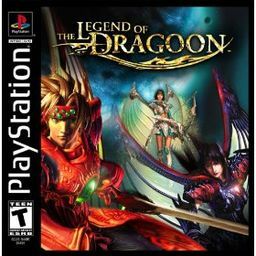 Legend of Dragoon has yet to see a sequel, yet the demand for one is high. I doubt we’ll ever see one, but darn it we will always pout and scream about getting one.